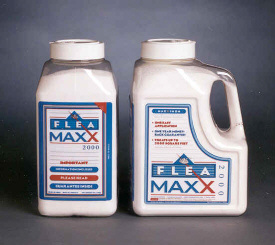 Flea Maxx | Bugs Etc..., Inc.
FLEA MAXX is a boron-based powder that kills flea larvae living in your carpet and furniture. The powder penetrates deep into the carpet fibers down to the matting at the heart of the flea problem, away from your family and pets. And it's designed to stay there and continue to protect your home and family from new fleas brought inside on you or your pets. Don't worry about mess or odor – There are none. FLEA MAXX is specially formulated to produce low dust or messy residue for you to clean up! 1. 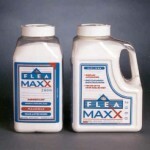 Apply FLEA MAXX to carpeted areas and rugs in the home. Start with the most heavily infested areas. Thoroughly brush powder into carpet. Any broom will work, but push brooms work best. DO NOT HEAVY VACUUM FOR THREE (3) DAYS! After the third day, vacuum your most troublesome areas more often. 2. Apply FLEA MAXX powder to upholstered furniture. Remove loose cushions and apply powder underneath. Brush powder into the crevices and creases of your furniture. Pay special attention to furniture commonly used by your pets. removing fleas from your pets, especially on cats. Be sure to consult your veterinarian for the most effective treatment for your pet. DO NOT APPLY TO PETS. 4. If carpets need to be cleaned, do so before application allowing carpets to completely dry for two (2) or three (3) days before powder application. If you frequently shampoo carpets, allow eight weeks after treatment before shampooing. 5. BUILD A FLEA TRAP In problem areas, place a bowl of water beneath a night light. Fleas are attracted to the heat and moisture and will jump into the bowl. Once there, they are unable to hop out. This flea trap will not eliminate the flea infestation, but it will help to keep the newly hatched fleas off you and your pets while FLEA MAXX eradicates your flea problem. home. NOTE: If high adult flea population exists or develops after treatment, you may apply a pesticide labeled to kill adult fleas. 6. GARAGES. Garages and basements may be a source for flea problems. FLEA MAXX powder does not adhere to concrete. However, if your pets spend time in the garage or basement, place a few area rugs treated with Flea Maxx in several locations. You into may also wish to use a spray pesticide registered for fleas in areas of the garage and basement where you have noticed fleas. 7. DOES YOUR CAT HAVE A FAVORITE LEDGE? If so, vacuum first thoroughly and wipe the entire area completely to remove any flea pets eggs which may have dropped there. 8. IMPORTANT. Areas to pay especially close attention to include: under beds; under and behind couches; waterbeds with pedestal drawers; and any other out-of-the-way areas your pets may frequent. These areas may be a prime source for flea problems and should be treated with FLEA MAXX. 9. AFTER EIGHT WEEKS, if your pet continues to have numerous fleas, this may indicate a yard infestation. Treatment with pesticides labeled for yards may be required. 10.PLEASE REMEMBER: FLEA MAXX works slowly, eliminating the adult flea population. Please allow eight (8) weeks for complete, satisfactory results.